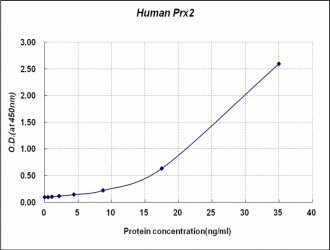 Peroxiredoxin (Prx) is a growing peroxidase family, whose mammalian members have been known to connect with cell proliferation, differentiation, and apoptosis. Many isoforms (about 50 proteins), collected in accordance to the amino acid sequence homology, particularly amino-terminal region containing active site cysteine residue, and the thiol-specific antioxidant activity, distribute throughout all the kingdoms. Among them, mammalian Prx consists of 6 different members grouped into typical 2-Cys, atypical 2-Cys Prx, and 1-Cys Prx. Except Prx VI belonging to 1-Cys Prx subgroup, the other five 2-Cys Prx isotypes have the thioredoxin-dependent peroxidase (TPx) activity utilizing thioredoxin, thioredoxin reductase, and NADPH as a reducing system. Mammalian Prxs are 20 - 30 kilodalton in molecular size and vary in subcellular localization: Prx I, II, and VI in cytosol, Prx III in mitochondria, Prx IV in ER and secretion, Prx V showing complicated distribution including peroxisome, mitochondria and cytosol.